Just before Robert Hooke’s rightly famous microscopic observations of everything from the “Edges of Rasors” to “Vine mites” appeared in Micrographia in 1665, the insatiably curious and incredibly prolific Jesuit scholar Athanasius Kircher [see here] published what is in many ways a more spectacular work. Mundus Subterraneus (Underground world), a two-volume tome of atlas-like dimensions, was intended to lay out “before the eyes of the curious reader all that is rare, exotic, and portentous contained in the fecund womb of Nature.” There is an “idea of the earthly sphere that exists in the divine mind,” Kircher proclaimed, and in this book, one of more than thirty on almost as many subjects that he published during his lifetime, he tried to prove that he had grasped it. As a French writer put it some years later, “it would take a whole journal to indicate everything remarkable in this work.” There were extended treatments on the spontaneous generation of living animals from non-living matter, the unethical means by which alchemists pretended to change base metals into gold, and the apparent tricks of nature we now recognize as fossils. The book included detailed charts of “secret” oceanic motions, or currents, among the first ever published. The author’s more or less correct explanation of how igneous rock is formed was also arguably the first in print. 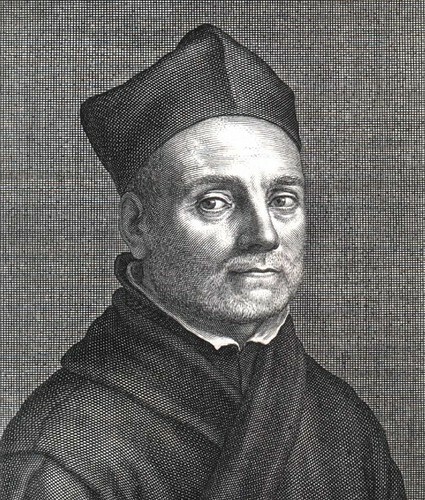 According to one modern scholar, Kircher “understood erosion,” and his entries “on the quality and use of sand” and his “investigations into the tending of fields” had their practical use. Mundus Subterraneus identified the location of the legendary lost island of Atlantis (something that modern science hasn’t been able to accomplish) as well as the source of the Nile: it started in the “Mountains of the Moon,” then ran northward through “Guix,” “Sorgola,” and “Alata” and on into “Bagamidi” before reaching Ethiopia and Egypt. Kircher offered a lengthy discussion of people who lived in caves (their societies and their economy). He reported on the remains of giants (also mainly cave dwellers) found in the ground. 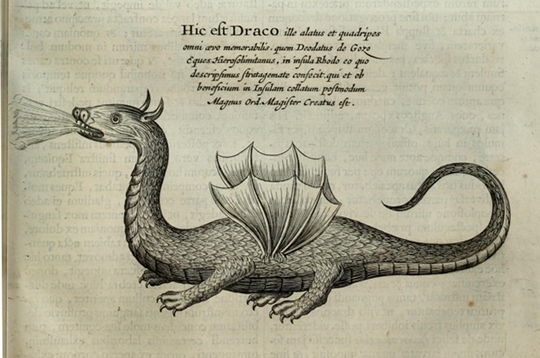 And he went into detail on the kinds of lower animals who belong to the lower world (including dragons). More on this extraordinary work– inspired in part by a subterranean adventure Kircher himself made into the bowl of Vesuvius– at John Glassie‘s “Athanasius, Underground“; browse the book at the Internet Archive. 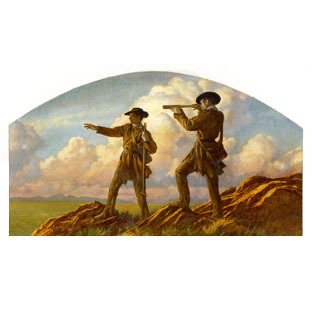 As we praise polymathy, we might recall that it was on this date in 1804 that Corps of Discovery– better known today as the Lewis and Clark Expedition– left Camp Dubois, near Wood River, Illinois, commencing what would be a trek over two years on which they became the first American expedition to cross what is now the western portion of the United States. 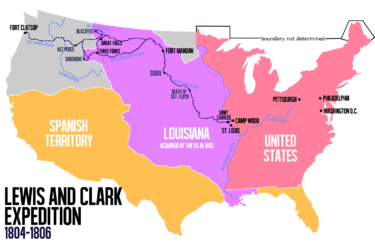 President Thomas Jefferson had commissioned the expedition shortly after the Louisiana Purchase (in 1803) to explore and to map the newly acquired territory, to find a practical route across the western half of the continent– a Northwest Passage– and to establish an American presence in this territory before Britain and other European powers tried to claim it. It was inspired by “Lost Generation,” which was itself inspired by the Argentinian political ad “The Truth” (for RECREAR candidate Lopez Murphy). 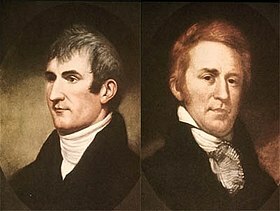 As we revisit our preconceptions, we might recall that it was on this date in 1806 that Lewis and Clark, having made it to the Pacific coast, foreshadowed the video(s) above: they reversed, and began their journey back East.